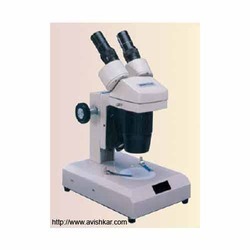 Exporter of a wide range of products which include student & medical microscope, avis microscope, advance research binocular microscope, standard microscope, microscope and microscope with camera. 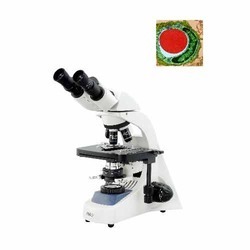 Our organization is engaged in manufacturing and exporting an exclusive range of Student & Medical Microscope is superior in quality and is known for long functional life. These are in highly demanded and are reckoned for its supreme quality features. We offer them at customized as per the requirements of our clients. These are offered at reasonable price. 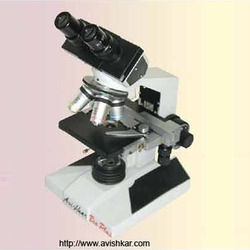 We offer Avis Microscope which is made of quality material and is available in attractive designs and shapes. 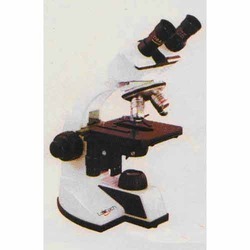 This microscope is known for its superiority, reliability and affordable price. They are effective in functioning and durable in nature. We manufacture them with modern technology to catch the demand in the market. Objective : Choice of partocal, parcentered, Semi Plan (SP), Achromatic objectives in magnification range, 4x, 10 x and retractable 40 x and 100x oil. 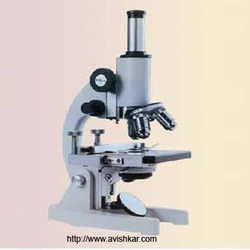 Our clients can avail from us an unmatched range of Advance Research Binocular Microscope to get a magnified image of the object and particles which are not visible through the naked eye. Our range of microscope is having various resolutions that can be adjusted as per the requirement in order to get a perfect view. Well designed die-casted staple frey and black contrast with hard instrumental Chromium finish. Special quality Binocular observation head inclined at 450 and rotatable through 3600. All prism and optical surfaces are anti refilection coated. Standared interpupillary distance and diopter adjustment provided. Dust proof quadruple nose piece with clik for perfect optical alignment. Double lens bright field Abbe’s condenser N.A. 1.25 with iris diaphragm movable by rack and pinion. By halogen lamp 6V 20Watts operated through built- in solid state transformer with electronic regulator. Prevent damage to slides and objectives. High class anti reflection coated self centres and parafocal achromatic objectives and superior quality eye pieces. In dust proof Thermocole Box in 12mm thick beautiful storing cabinet with sunmica door. 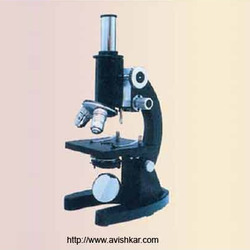 Standard Microscope is widely used in different laboratory research works. These are appreciated for features like a compact design, great performance and user friendly functions. 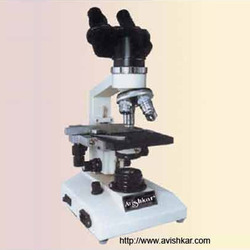 Our ranges of standard microscope are made from supreme grade material with advanced features. They are sturdily constructed and are made as per international industry standards and are very easy to operate and maintain. Wide Field eyepiece WF 10x/18mm paired with eye guards. 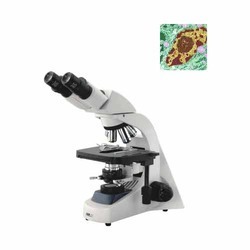 Our range of Microscope with Camera is extensively appreciated for features like durable finish standards, longer service life and reliable performance. Clients can avail from us different shapes and sizes as per the specifications of our customer. They are used in Institutes of Institutes of Science & Research, Medical Institutes, Atomic Research Center and Pharmaceutical Research Center. Wide Field eyepiece WF 10x/22mm paired with eye guards. XP series DIN Semi Plan Achromatic objectives 4x, 10x, 40x (Spring loaded) and 100x (Spring loaded), Oil immersion. Moveable Sub-stage ABBE condenser NA 1.25 with aspheric lens. What Makes working on Splendour Microscopes, a ‘Spectacular Vision Experience’? 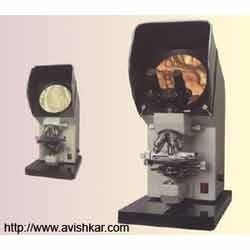 Optics Fitted with our time tested DIN Achromatic Objectives, designed as per Ferman Standards of Optical Excellence. Compensating Extra Wide filed (Filed No.18) Eyepieces they provide a colourfree image. A pair of WF 10x/18 Eyepieces. Huy.6x & WF 15x are available. Fatigue Free Focusing Traveling on Ball slides The Co-axial focusing system, incorporates a very precise and were resistant liner bearing mechanisum that eliminates vibration and backlash. The coarse adjustment knob has a built in control to after the tension of the motion. The touch sensitive fine focus knob a are graduated in 0.02mm increments. Large Mechanical Stage The 150X120 mm Stage Plate incorporates a linear bearing mechanism with right hand low - positioned CO-AXIAL movement Control. It has a travel range of 75mm along the X-Axis and 45mm along the Y-Axis for easy scanning of large specimens. A.0 1mm vernier provides accurate location of the specimen area. Nose Piece Precision-built quadruple revolving nosepiece, traveling on ball bearing, ensures a common field Center, on changing magnification and reintroduction. The soft ribbed grip for easy rotation, helps prevent damage, from gripping the objectives. Illumination Light Control Built-to a well contoured, Compact Base, with Convenient hand rests, and powered by a 6V-20watts halogen light source, the illumination. The lamp is precentered for your convenience. Replacement of lamp can be done without opening of base or electricals. Light intensity can be varied through electronically controlled knob. The lllumination is furhter enhanced through well designed illimonator lens system and a substage Abbe Condenser with N.A. 1.25 and built in lris Diaphragm and Filter Holder. Optinally, the Bright Field Condenser can be easily replaced by Phase Contrast Turret or Dark Field Condenser. Splendour introduces, for the first time, Mould Protection as a standard feature. Mould formation is a menace in most parts of the word, with moderate to high temperatures, high humidity and air pollution. All these factors encourage mould formation which could etch into the optical surfaces and permanetly damage them. Splendour’s protection treatment ensures mould-free viewing, a boon in the recent environmental conditioins. Like checking linear measurement and comparison of contours etc. Din standard TC series objectives, optionally / plain optical system. 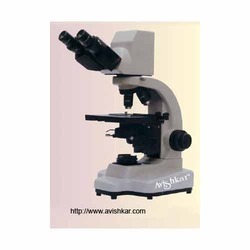 A most durable, sturdy & elegant designed body for utmost convenience to use and to accept several optional accessories as multipurpose system microscope. Coarse and fine focusing system. Coarse focus range 30mm and fine focussing reading to 0.002mm. Revolving quadruple/quintuple nose piece with ball bearings for perfect alignment. With Co-axial mechanical stage low drive control, travel area 75-50mm. Movable abbe condensor N.A. 1.25 with iris diaphsam and filter holder. Halogen illumination system having 12V/100W halogen lamp with variable light control. Observation on screen/optionally binocular head. 100/125x to 1000x 7 also upto 1500x.